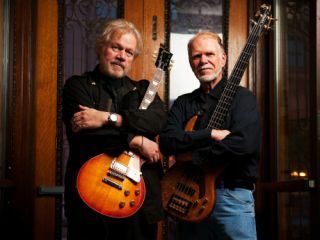 The Guess Who/Bachman-Turner Overdrive guitarist, Randy Bachman, explains to TG why he's been a John Lennon devotee for most of his adult life. Randy Bachman is so enthusiastic about the life and work of John Lennon that he collects early demos and has even hosted whole radio shows in his native Canada devoted to the great man. You could be forgiven for thinking that all the time Randy's not playing guitar himself, he's listening to Lennon doing it instead. What exactly was is about Lennon that first caught your attention? "Age-wise, John was kind of a contemporary, but for me the guy was the template. When I watched him I realised that he'd got everything I wanted to project into a band myself. The very first thing I noticed when I first watched The Beatles on TV was the way he did that little bounce up an down on the spot that just used to keep the drums in time. I thought that was so cool; I used to do the same thing with the drummer in my first band, who also happened to be my brother and probably got kinda annoyed! I think that's what I remember more than the music early on - not because the music was forgettable, quite the opposite. That music touched my generation so profoundly and with such ease that we seemed to accepted it unthinkingly, and instantly forgot there'd never been anything like it before. That was the power it had." What continues to excite you about his music to this day? "I think what made John Lennon so exiting as an artist is that, like Dylan and other musicians with a truly important musical legacy, he had several faces, personas that changed over time as he developed. There was the young guy who started out in black bike leathers with a passion for rock 'n' roll from the USA, then there was the suited pop star writing those impossibly catchy tunes, then there was the psychedelic hippy preaching peace and love, and finally the angry protest singer going it alone with Yoko. And each incarnation drastically changed his music but never killed the quality." Randy performing his own protest song. The Guess Who's 'American Woman' was actually the Statue Of Liberty. Do you think there is a unifying theme to Lennon? "If there is, it's quite simply his genius. As a musician, when you start to pick apart his work - right from the Beatles early days and those songs that sounded so catchy and straightforward - they're nothing of the sort when you look at the chords. Some virtually have a chord change per syllable, or a song like 'If I Fell'['A Hard Day's Night', 1964], which I have an early demo of and is a song that's still a favourite I play in my live shows. That composition is a really beautiful sophisticated jazz progression, yet the melody is pure pop. Structurally, when you analyse them, his songs are all incredibly sophisticated. They all seem to have at least one unconventional progression in them, and the way the chords tie so tightly into the vocal melody is what I think makes them all pack so much emotion." Do you think all theses nuances were meticulously planned? "You know, people have made a living deconstructing Lennon ad The Beatles songs, because of their compositional sophistication. But what's so exiting about John is that he never had any of that training on musical theory, something just spoke to him and he just knew what sounded right. It's the same with his lyrics during The Beatles' psychedelic period. It might have all been 'marmalade skies' and 'newspaper taxis', but the amazing thing was you always knew exactly what he meant. Like all really great music, it almost feels like it's being channelled from somewhere else. It's that savant quality about all his work, solo and with The Beatles, that's the gift we other musicians bow down before." Do you think there was more to come? "Absolutely. I think John was still on an upward curve that would have simply continued if it hadn't been so cruelly cut short. I think his early solo albums: 'Plastic Ono Band'  and 'Imagine' were some of his strongest work, with or without The Beatles. Personally, I loved it when he got political, because you saw this guy had bravery and integrity to match his musical gift. For me, that brave era of protest was his finest hour. I guess it started with 'Revolution' , which is still one of my all-time favourites. In fact, I've even used those notes from the electric intro as inspiration for one of my own songs… I'm not saying which!" During your life-long love of Lennon's work, is their one particular memory or experience that stands out? "I'm lucky enough to be a friend of George Martin's son Giles, and a while back he called me to his studio just after he'd finished transferred all The Beatles back catalogue of work with his father from reel-to-reel onto Pro Tools. He asked me what I'd like hear - and you can imagine, I was like a kid in a candy store. It was almost all too much to take in. So we eventually listened to 'Day In The Life' ['Sgt Pepper's Lonely Hearts Club Band', 1967, above] in meticulous detail, the individual breakdown of the parts that make that awesome discord/chord that opens 'A Hard Day's Night'. When you hear each of those guys play one chime individually it sounds like nothing at all. Then you listen to it all together, and right there you can hear the magic of Lennon and The Beatles. Pure musical alchemy." TG209 (on sale 26 November) features John Lennon on the cover and honours the working class guitar hero's contribution to the guitar world, including interviews with 'Nowhere Boy' Aaron Johnson and 'Imagine' session guitarist Joey Molland.